Many students (including 5 St. Edward’s U. grads since 2014) come into the University of Notre Dame’s ESTEEM Graduate Program in Entrepreneurship and Innovation feeling restless and boxed in by the career choices laid out in front of them, but full of energy to create a better world and make an impact. For this reason, ESTEEM emphasizes the action of entrepreneurship, not just the study of it. ESTEEM allows students with technical backgrounds to explore the world of business and entrepreneurship, learning how to combine their current skills with new ones to become leaders in their chosen fields. 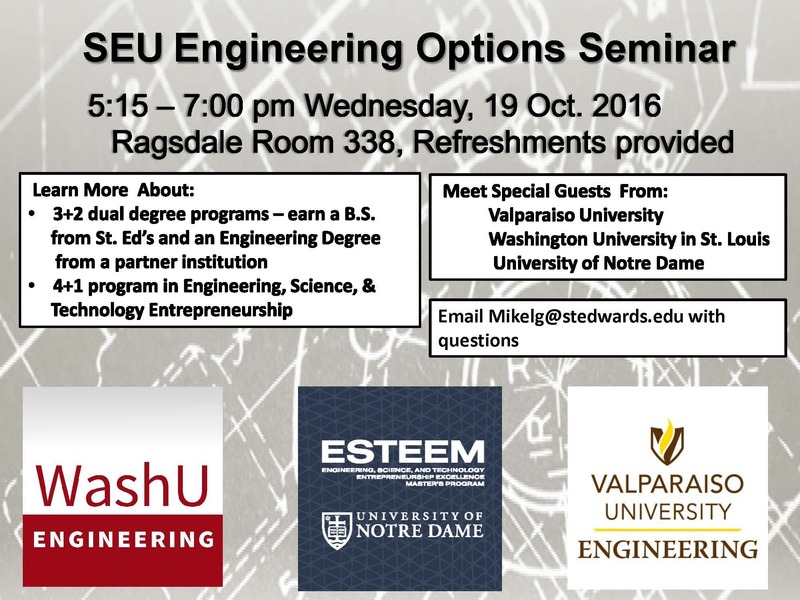 You may email Kyle Williams for more details or learn more about the program at esteem.nd.edu. Many students come into the University of Notre Dame’s ESTEEM Graduate Program feeling restless and boxed in by the career choices laid out in front of them, but full of energy to create a better world and make an impact. They are fascinated and passionate about science or engineering while yearning to put their learning into action with the tools of business, innovation, and entrepreneurship. It is not unusual for ESTEEM graduates to leave the program throwing around words like “transformed”, “confident”, “problem solver”, and “entrepreneur” to describe themselves. ESTEEM allows students with technical backgrounds to explore the world of business and entrepreneurship, learning how to combine their current skills with new ones to become leaders in their chosen fields. Our alums include Janaee Wallace (2016), Karl de Zoeten (2017), Ralph Hayyat (2017), EB Conklin Reyes (2018), and Valeria Gonzalez (2018) from St. Edward’s University. Are you a STEM, economics, or design major, but also interested in entrepreneurship, innovation, and technology? The ESTEEM Graduate Program is an 11-month master of science degree program at the University of Notre Dame that equips students from technical backgrounds with the skills and experience to launch new businesses, become innovators within large corporations, and be leaders of dynamic, innovative teams. Over the course of a year, students are immersed in an entrepreneurial sandbox, where they get their hands dirty with entrepreneurship and innovation through a cutting-edge curriculum, a capstone commercialization thesis for an emerging technology, and outstanding out-of-the-classroom experiences. You can hear about how transformative this program can be from one of our most entrepreneurial alumni here! ESTEEM emphasizes the action of entrepreneurship, not just the study of it, by letting students get their hands dirty with entrepreneurship in one of the most realistic entrepreneurial sandboxes in higher education. By the time they graduate, due to the rigorous academic experience, exposure to real-life business ventures, and exceptional mentorship, ESTEEM students find their technical skills impactful and marketable in a rapidly changing economy. Students are launched into career tracks outside of narrow technical roles, taking leadership positions at the intersection of business and innovation. The attached brochure contains the latest career placement statistics for our graduates. 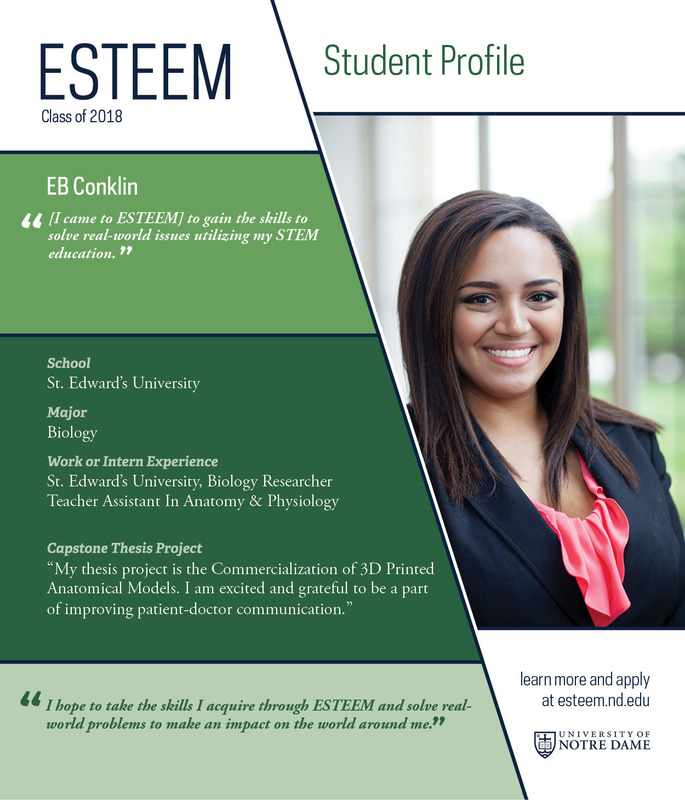 ESTEEM has had a great relationship with St. Edward’s University, with alumni/current students such as Janaee Wallace, Karl de Zoten, and Ralph Hayyat. After being on campus again this past fall meeting faculty and students, we would love to see more St. Edward’s University graduates join the program! You can find more information at http://esteem.nd.edu or by contacting Dustin Mix.